I've been studying this for a while. I think many city people have a different view of their lawn than suburbanites. In suburbia it's all about having a lush, thick, uber healthy green lawn. In the city, its a combo of having a lawn healthy enough not to embarrass you....yet not so healthy that you need to mow it more than once a week. So, this year I dethatched my grass and then laid down a dandelion killing fertilizer. I thought that in a week or so, I'd water. This would keep my lawn marginally healthy and dandelion free....yet not so nurished it would grow too fast. You can imagine the mixed feeling that I am having watching a nice, unexpected, sinking rain come down over my freshly fertilized lawn this morning. Gasp, my lawn might be too healthy this year. Someone needs to invent a grass hybrid that only grows 2" tall. I'm still on the hunt for a concrete guy. I'm in the throes of my search. I'm stressed and don't want to jinx anything, but will post on it all later. 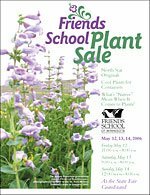 So as a nice diversion, I'll let you know that the annual Friends School Plant Sale takes place this year on May, 12th, 13th and 14th. I'm not affiliated in any way with the school, but stumbled upon the sale somehow three years ago. It is huge. I'm not a gardener. The first year I went to the sale, the sheer size of it and the enthusiasm of the shoppers freaked me out. I ended up with a few herbs. However, I learned a ton reading through their catalog (well worth downloading even if you don't attend their sale). The second year I was better equipped to deal with it all and came home with a very nicely priced array of herbs and vegetables (including heirloom) for my garden. I have been generally impressed with the quality of plants. They for the most part have survived.....in spite of me. The quality has improved quite a bit since my first visit - I think this has to do with their move to the State Fair Grounds where the plants aren't sitting in the sun all day. The third year, I outfitted my new vegetable garden with heirloom tomatos and herbs. When it was all said and done, I had 9' plants all weighed down with fruit and spices to make tomato sauce & pesto. Last year I went to their Fall bulb sale and picked up a big bag of blubs (its kind of addicting). I planted them. My evil squirrel dug them all up. I cried. I re-planted the half eaten bulbs. I also purchased 5 peony plants - the good old-fashioned kind. Countryside Gardens, the peony grower, that was on hand patiently helped me pick out plants that were appropriate to my yard and then explained to me in great detail exactly how to keep my new purchases alive. Low and behold, each and every bulb & peony I purchased last fall has come up this Spring! At any rate, highly recommended and a lot of fun! Back in January I started getting bids to have my front doorstep replaced. 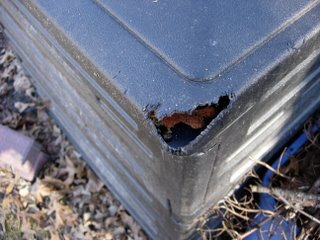 For reasons spelled out in this post (I can't mention them again here without getting all freaked out again), I wanted to get this replacement done the moment the snow left the ground and the temp. was high enough for concrete to cure. The contractor agreed. He understood. I called the contractor back in Feb. and told him he had the job. So, why is it now the end of April and I have no new steps? The contractor is flaking out. I am never able to get this guy on the phone cell or office. He returns calls 3 days later. Last I heard from him I was on his calendar for today and he would "touch base." Well, that touching of base never happened. I'm sure this is a small job and he's shuffling it around job that will make him more $$. The funny thing is that if he ever actually talked to me he'd find I decided to also replace the sidewalk running down the side of my house. So in the end, maybe this isn't so small of a job. Dangnamit. Now I am once again calling concrete contractors trying to get a bid. But, of course they are now busy doing jobs they bid back in Jan. Crap. If for whatever reason they are not going to do the project, why don't contractors just say so? This would give the homeowner the chance to go out and find someone that wants the work. This just ticks me off. Really, really ticks me off. All this and there is a dead squirrel laying out back by my trash bins that at some point I'm gonna have to shovel into a bag and into the trash. Maybe I'll hope for a racoon to carry it away. I'm thinking this weekend is gonna stink. If anyone has the name of a good concrete contractor that works in the Twin Cities, I'm all ears. Yesterday I blogged about a natural gas leak I had in my basement. 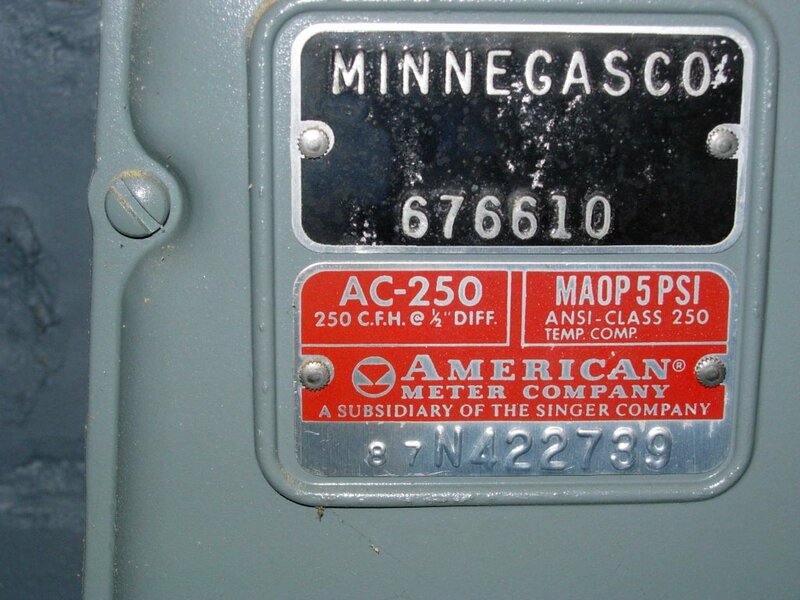 Tonight, I'm posting pictures of my gas meter, etc. It will give you a visual :-) Of course, if you see something amiss, feel free to let me know. The meter looks to be kind of new (to my untrained eye). I have one of those newfangled systems that calls in my reading using my phone in the wee hours. I only know this because a few months after I moved into my house all of a sudden my bills went up dramtically and they were labled "estimate." When I called to ask what this all meant, I was told the system was malfunctioning and I needed to have a battery changed. 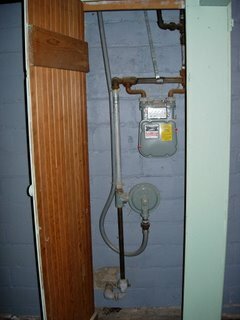 The meter is against the basement wall parallel to the street. There seems to be a cruddy old pipe that carries the gas in at the bottom. And there is a flexible plastic tube that carries fumes (?) out to a little vented hole in the basement wall. There are two old pipies running out of the top of the meter and I suspect these carry the gas to the rest of the house. The whole thing appears to be held up by metal strapping. 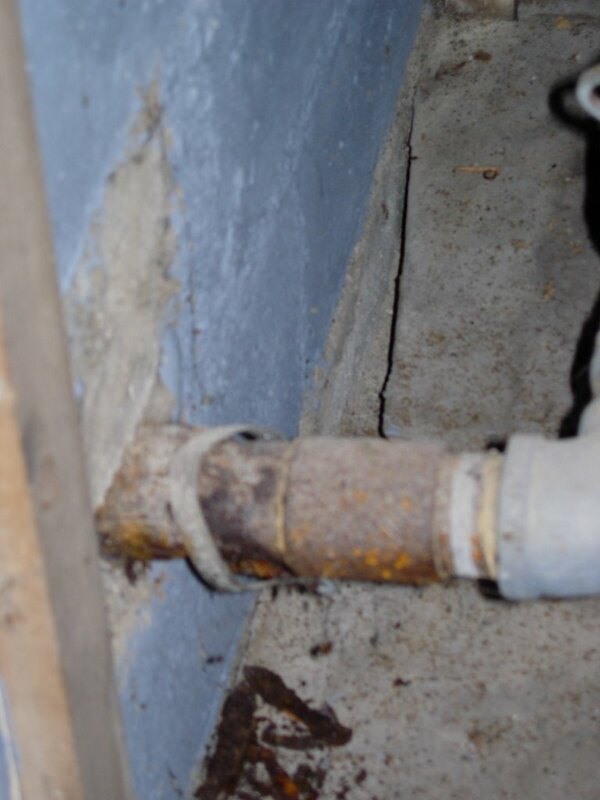 The leak this time was at the old cruddy pipe running into the house. The gas company guy tightened the connection and the leak stopped. But this is the second leak in three years from that spot. Is the pipe running from the street to my house my responsibility or the gas company's.....or does this depend on the city you live in? Anyone? Anyone? 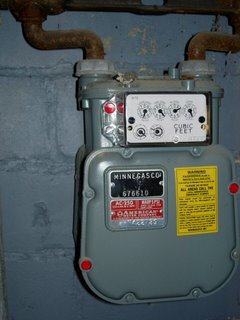 Yesterday I wrote a post that mentioned the poor customer service I had received from the guy in charge of energy audits at Minnegasco/ Centerpoint Energy. After publishing that post, I went out into my living room to watch the news. I immediately smelled the rotten egg aroma of natural gas. I went outside to see if was wafting through the window. Nope. I went downstairs to see if it was originating from down there. Bingo. The smell was very strong to my nose. I called Minnegasco's "hot line" and asked them to send someone out to check. When the operator told me that if there was no answer at my door when their service people arrived, they would call a locksmith or break down the door.....I made a little joke about leaving the door unlocked before passing out. Turns out this is akin to making a bomb joke when going through TSA. For the record, poor judgement on my part and not recommended. Anywho. The service guy arrived (to me sitting out on my front doorstep - to make up for my poor judgement joke). We went downstairs. He said he didn't smell anything. But as soon as he took out his detector, off went the alarm. Turns out that there was a leak at the controls for my hot water heater and a leak where the natural gas pipe enters my house. He tightened both joints and the smell went away. I asked him again if he really couldn't smell the rotten eggs smell. He said no. This is strange to me because since I have moved into this house, this has happened two other times. I have smelled natural gas. The service guy has come out and told me they don't smell anything. Their detector's alarm goes off and we find a leak. They fix it and life goes on. 1) Can these little leaks just happen spontaneuosly? Doesn't something have to happen to cause them? 2) Is this common to have this happen so frequently? I've never had so many gas appliances (clothes dryer, furnace, hot water heater, stove), so this is new to me. 2) Why can't these service men smell what I think is an overpowering smell? 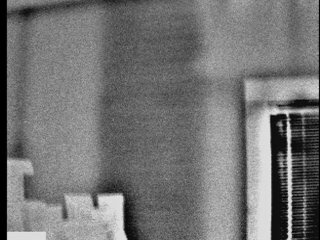 Do men have less ability to smell? (this would explain the 5 yrs I spent at a former job daily breathing in the overpowering aroma of a coworker's aftershave) Or do I just have an uber sense of smell? 4) Would this explain the sore throat & general fealing of crappiness I have had for the past week? 5) Could the audit guy at Minnegasco have a little botton he is able to push to create these leaks when he reads that he has been dissed on someone's blog? Or is that just paranoia? This post is totally out of season. But, I keep losing the cd with the photos on it. So, I figure that while I have the cd in my posession, I'll post. I first moved into my house the end of Oct. in 2002. It was a very warm day when I moved. Once I had my stuff in the house, things turned cold fast. Very cold. I quickly discovered that my new house was not weather tight in the least. 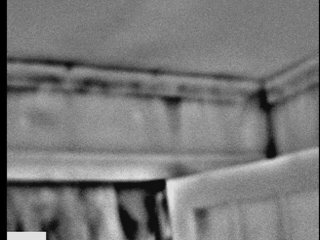 You could stand in my living room and feel a frigid breeze blow across you. The upstairs was unbearable. One of the first things I did was schedule an energy audit. The guy came out and did an audit for $25. 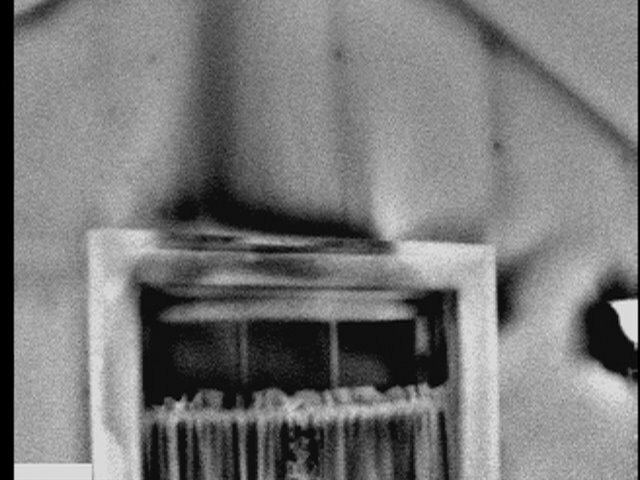 The highlight of this simple audit was the "blower door test" where they take a huge fan and put it in your front door. they then turn on the fan and create a vacuum in the house. By doing this they can measure the turn over of air in your house per hour and the tightness of your house. The auditor also tested the efficiency of my gravity furnace and gas water heater and left me with an estimated payback period if I replaced each with new equipment. He left me with a nice list of things to do to start sealing up this wind tunnel of a house, detailed instructions and a bag of weather sealing goodies. I was very motivated and completed all the suggestions on his list. The following year, I decided I was ready for a higher level of audit. So, I scheduled a full audit. The price for this audit was $100 with the promise from Centerpoint that they would waive the fee if you completed all the tasks suggested by the auditor. The high point of this audit was the infrared reading of the exterior walls of the house. The auditor went through the house and "read" each wall with the infrared carmera.....with me tagging behind. I was fascinated. The camera was like an x-ray machine. Spots that showed up darkened where spots where cold air was infiltrating. This was a huge learning lesson for me. 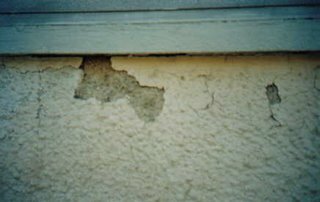 First, I discovered that insulation had been put into my walls at some point (there was no evidence of this - meaning the previous owner who did this blew the insulation in from the inside rather than cutting through the exterior stucco. Bless his heart.) In fact, in one photo you can see behind the studs, plaster & lath that they forgot to insulate one section. 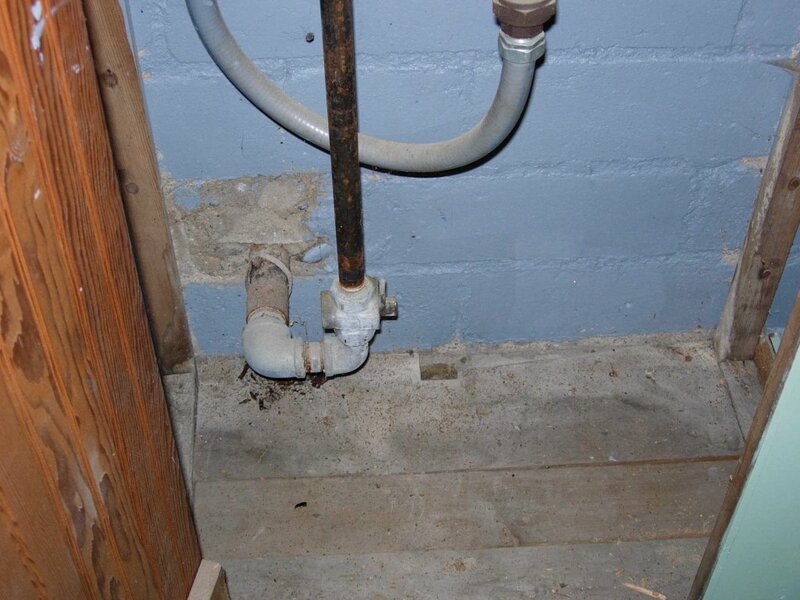 Second, I learned the a LOT of air can enter your house through cracks at the baseboard, cracks in plaster, electrical outlets, wall mounted lighting fixtures. Taking the simple steps to seal these up can make a HUGE difference. Interestingly, I asked the auditor about my original wood windows and my gravity furnace. I wanted to hear his take on it. 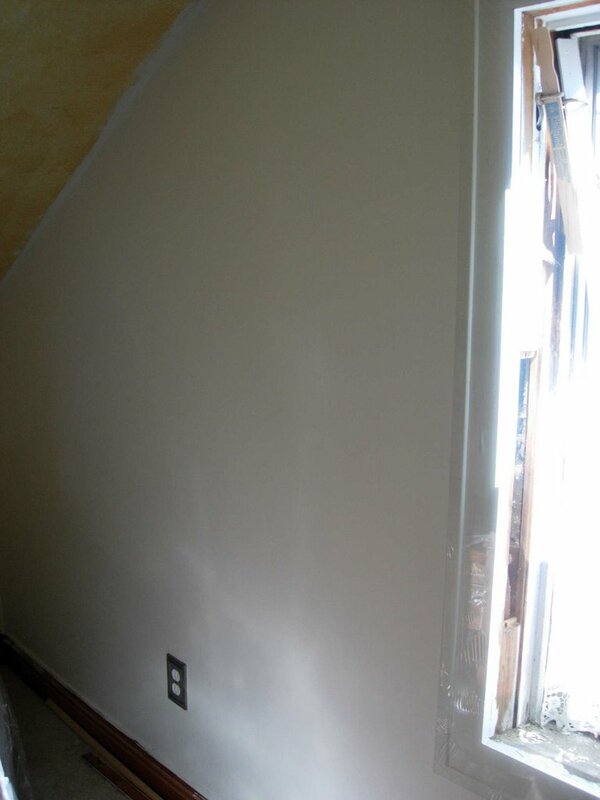 Much to my relief, he explained that air infiltration takes place by the window molding and this can be easily sealed up with caulk (as the photos show). He then gave me a little speech about old growth wood and how replacing the windows would be a mistake :-) When he did the calculations on the payback period for replacing my gravity furnace it turnd out to be 15 yrs (20 yrs including the cost of asbestos abatement). He even suggested that I should wait on adding additional insulation to my attic until I had completed all of the other measures. 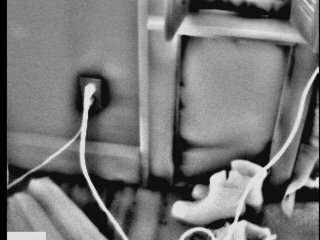 Once again, the auditor left me with a list of things to do, a bag of goodies, and the oh-so-cool cd of infrared photos. I got to work and made all of the changed he suggested. The difference in comfort throughout the winter was dramatic. I'm going to wait until I've had a chance to restore the rest of my windows and then I'll have another audit to help me continue to fine tune things. When I was a little girl we used to go visit my Grandma on her farm (my Grandfather died before I was born) for the weekend. She lived just far enough away that we would sometimes stay at her house instead of driving all the way there & home in one day. I was always pretty happy when the decision was made to stay the night. I thought this old house was very cool. The house was built by my Grandparents when they were first married. It was a typical early 1900's MN farm house. It's funny the things that made an impression on me as a child. I can remember many of the features of that house in great detail. 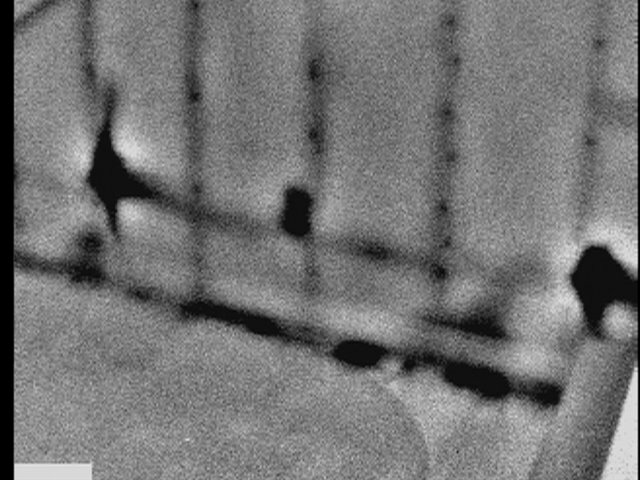 I remember the old wood burning stove, the flour bin, the wall sink, a separate faucet for drinking water and the potato masher (who knows why) in the kitchen. I remember my uncles playing cards, smoking and laughing at the big kitchen table. I remember home made bread rising on the countertops and my Grandma's overalls & barn boots by the back door. There was a big, built in buffet in the formal dining room. 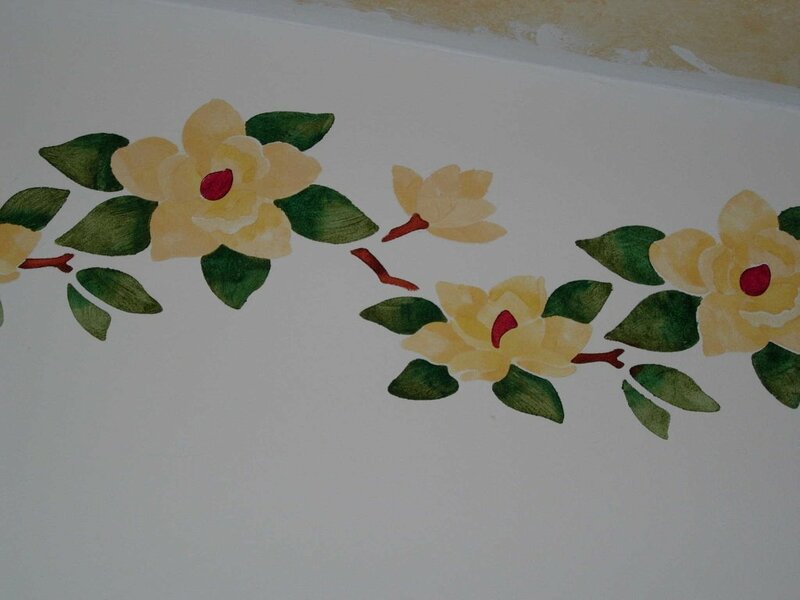 My mom tells me there was a mural painted on the wall in the room done by a traveling door-to-door artist my Grandma hired during the Depression, but I can't remember it. I do remember the front porch where my Grandma kept a box of old toys that I was allowed to play with - even though I was much more interested by the kitties & baby pigs in the barn. Then there was upstairs. I grew up in a one story house, so this was living large to me. There was a huge old fashioned bathroom with white tiles (it was originally a nursery until indoor plumbing was added). I had never seen a bathroom so big. There was a bedroom that had my uncle's train collection all set up (I was not allowed to touch this). And then there was my favorite room in the entire house. The bedroom that I got to sleep in. The bedroom had three old metal beds. To this day I am very partial to those metal beds. 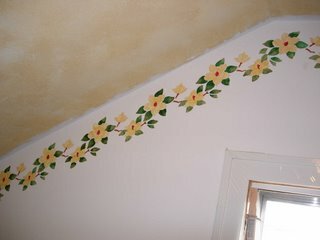 And when you laid down on the metal beds you saw the flowers my Grandmother had hand painted in a string across the top of the room. She did these free hand. I remember laying on that bed and looking up at those flowers and wishing I had a room like that. 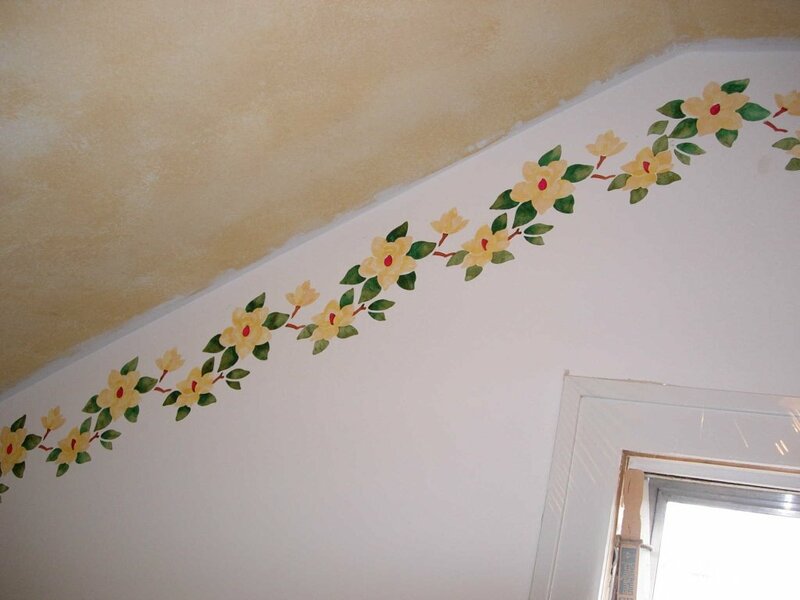 Fast forward a lot of years and you understand my compulsion to have flowers around the top of my bedroom walls. 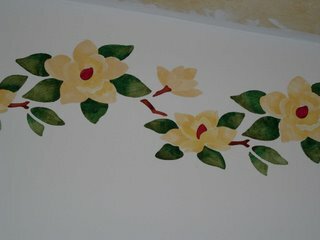 Sadly, I don't have the artistic talent my Grandma had to paint free hand. 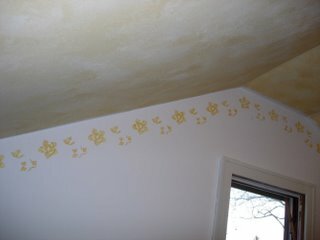 But, I do have the knack for stenciling. 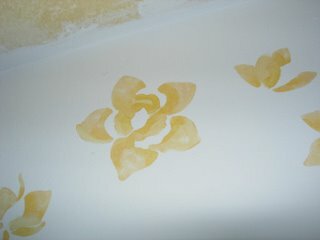 In my last house I found a simple rose pattern that I liked. The bedroom in my current house is a bit of a mess. The previous owner did a really bad drywall job on it and then sponge painted it yellow/gold. I haven't been able to decide what color paint I want to use up there and had put off doing anything. However, the room finally got to me. So, I decided I would at least work on the two end walls. I spent a weekend patching screw holds & seams in the drywall and then repainting those walls white. I had also decided this is where the stenciling would go. For the life of me, I could not find my old rose pattern. So, I picked up another pattern that I thought had an Old World appeal to it (these are not Arts & Crafts designs). Magnolias. I started painting. I probably should have read the description a little better before choosing this design. Turns out it was an 11 layer stencil that needed to be hand shaded. It took me 3 days and all of my artistic talent to finish the design. I think it turned out well. Although, it's much more elaborate than what I had in mind. The colors are also a bit brighter than my usual pastels. We'll see....I think it will grow on me. 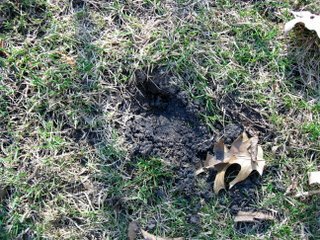 Spring has not sprung at StuccoHouse until the Evil Squirrel that lives in my back yard executes his first strategic attack of the season. This is a battle of Girl vs. Squirrel that has been waged since the day I moved into this house. Each year, the Evil Squirrel cleverly plots to outdo his antics of the previous year. Sadly, each year he succeeds. The first year I moved in, he celebrated Spring by digging holes six inches apart through my whole backyard with the lame excuse that he was looking for buried nuts. He followed this up by chewing through the corners of my roof to gain access to the soffits. The second year I lived in the house, he waited until I let my guard down and then bit the heads of off all of my just bloomed tulips. Then he laid quietly in wait until I spent a kajillion on new bulbs for my garden, watched me lovingly plant them all, waited for me to go inside and then dug them all up and ate them. I couldn't believe it. This year he has decided to attack early and attack hard. His target? 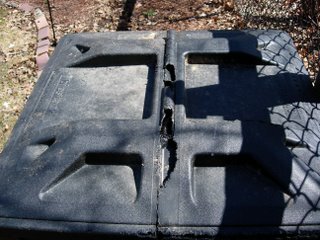 My compost bin. Look what that little snot did. He chewed up the cover so that it no longer works. Everyone assures me that squirrels have no capacity to plot evil. However, there was nothing in this compost bin except dried leaves and old grass. Evil? I think so. I'm sure this is not the last we have heard from the Evil Squirrel. I suspect he is eyeing my tulips and who knows what else. I have mentioned before that the stucco on my house was painted by a previous owner. He made some odd mixture of paint & cement and sprayed it on. 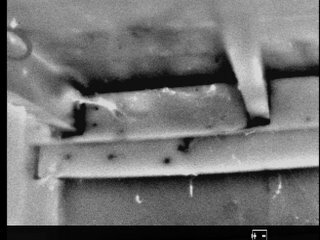 In some places it is now coming off in layers. For the past three years, I have been looking for a solution. I have known that it probably will not be pleasant or cheap to fix it. This past week I got a flyer on my front doorstep from a company that does liquid, vinyl siding. The brochure said it was very inexpensive. Curious, I called the company and a guy came out that same day. He said that they would be able to spray a liquid type vinyl over the existing stucco in any color that I wanted. This would form a waterproof seal that would last indefinitely. Their warranty is for 30 years. He showed me lots of photos of houses that they have already done in my city. Because recoating my house would be a larger job for them, he also said they would throw in vinyl replacement windows for the first floor of my house at half price. 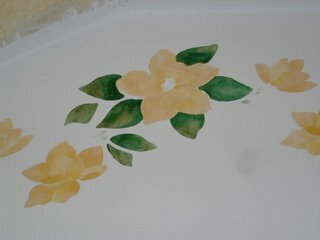 Now I have already restored my bathroom window, but I'm getting tired of stripping the paint off those old things. And this guy gave me a lot of information about how the new windows would improve weatherproofing. I was impressed. I asked him to put my house on his schedule and gave him a downpayment. I haven't decided about the windows, but I am leaning towards having him do those too. What do you think? Have you heard of this liquid siding product?